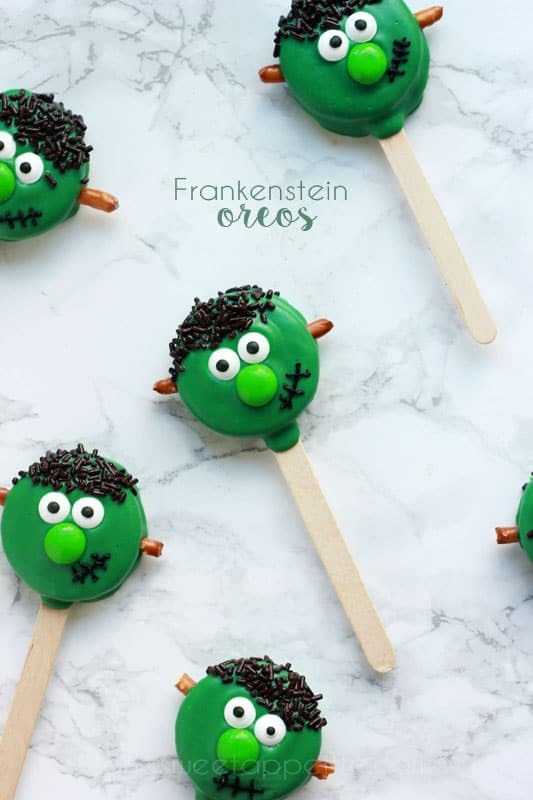 These Frankenstein Oreo’s are the perfect Halloween treat! Ok, how cute are these little guys? I’ve been working on a BIG project that’s taking up about 98% of my time but decided to take a time out and create these fun little guys. I did my first test run live on Periscope which was a little intimidating. It’s not easy creating an edible character when you’ve got an audience. I was pretty sure I’d make a million mistakes but in the long run it ended up working out perfectly! 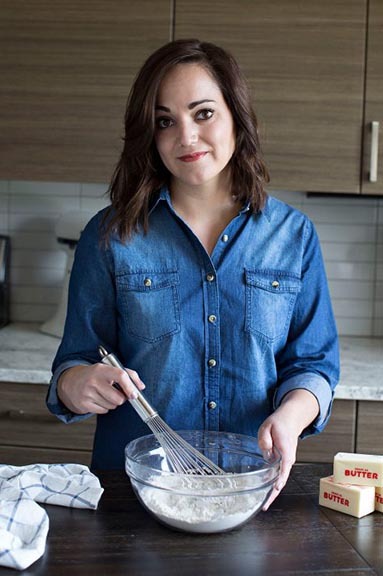 I won’t have a printable recipe in this one so make sure you read through the post carefully. You won’t want to miss a step! Melt your candy melts according to the package. If it seems too thick try adding 1-3 tablespoons of shortening (DO NOT use butter) to thin it out for easier dipping. Dip the bottom of your popsicle stick in the melted chocolate. Gently push into the center of one cookie. Allow to harden so the chocolate will help keep things together. Spoon melted chocolate over the entire cookie. Gently tap on your dish to remove excess. Working quickly insert one pretzel piece on each side for “ears”, sprinkle chocolate jimmies around the top of the cookie for the hair, and top with eyes and m&m for the nose. Use the black frosting to pipe on a mouth. So what do you think? Easy enough that this would be a fun family project! 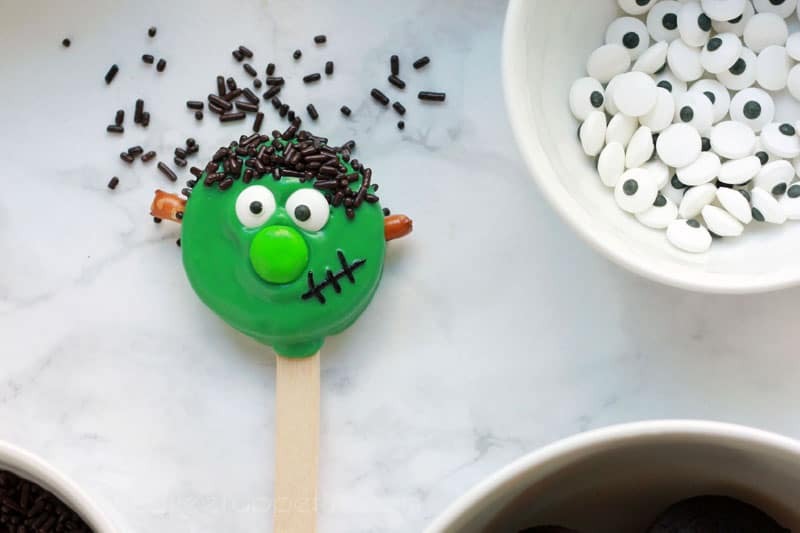 Let your little ones get in on the the fun and pass these out to family and friends!Just in case the instructions above are a little confusing I’ve got a cute little video tutorial for you below! Make sure you follow along and subscribe to my YouTube page for even more great videos. Of course! Hopefully I’ll get a few more up soon. 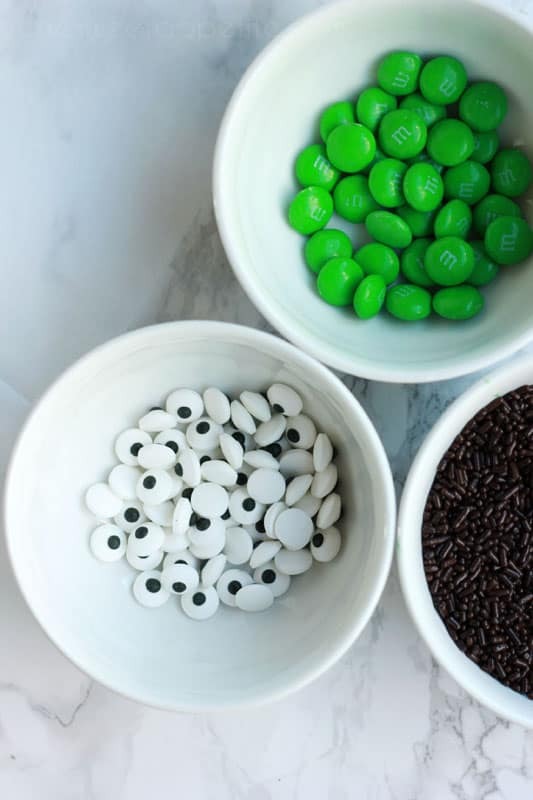 Where can you get the edible eyes? You can find them in the baking aisle of craft stores or on amazon.